Chantix is a pharmaceutical drug that assists – apparently quite effectively – in helping patients to quit smoking. The drug was approved by the FDA in 2006 after an accelerated review process (usually a telltale sign of trouble). There is some debate about whether it helps quit smoking (it probably does, but on one really knows for sure). But it seems pretty clear that in some cases - albeit a small minority of cases - a side of effect of Chantix is that patients on Chantix are far more likely to commit suicide. Chantix works in two ways. It blocks nicotine from stimulating brain receptors, so cigarettes do not give users the dopamine release they receive when they smoke, which makes smoking less appealing. At the same time, it stimulates the release of small quantities of dopamine to help decrease the desire for nicotine because the body is already getting some level of dopamine. Obviously, being able to pull this off is pharmacological genius. Unfortunately, after approval in 2006, it did not take long before reports began linking Chantix to suicidal ideations and action, depression, violent behavior and cardiovascular problems. After increased reports of a problem, the label has since been altered to reflect the risk of suicidal behaviors and thoughts. Now, the Institute for Safe Medication Practices said this week that even more problems are being identified beyond the reported heart and cardiovascular problems that have been previous reported. Specifically, the Institute believes that there may be an association between Chantix and serious accidents and falls (which some theorize is from the visual disturbance reported with Chantix), potentially lethal cardiac rhythm disturbances, acute myocardial infarction, seizures, diabetes, and psychosis. The Institute also found continued reports of aggression and suicide. Chantix have also been linked to Stevens Johnson Syndrome, a potentially deadly skin disease. Chantix accounted for 988 serious injuries in the U.S. in the last quarter of 2007, the highest of any pharmaceutical drug on the market. Putting this number in context, the FDA received a median of 5 reports of serious injury for 769 different pharmaceutical drugs over the same period of time. If you have more adverse reports than any other drug, it is a “Houston, we have a problem” situation, particularly when you are not one of the best selling drugs in the country. To put in it context, Pfizer has another drug, Lipitor, that has 10 times the sales of Chantix. 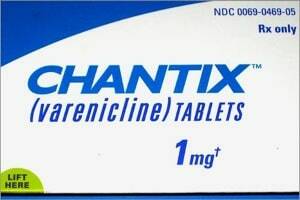 There were a lot of early efforts to link Chantix and diabetes because many people with Chantix had diabetes. But it did not work with Seroquel [see here] and it did not work with Chantix. Now, mass tort lawyer are trying it again with Lipitor [see here]. But these are tough claims to make? Why? Because people on Chantix, Lipitor and Seroquel were either at risk for diabetes in the first place or putting on weight that as a result of the drug or, in the case of Chantix, by quiting smoking. Don't get me wrong... these drugs may all cause diabetes. It is just very difficult to prove in a court of law.